I'm in the queue for a reproduction of the XVIIIb type sword in the collection of the Bayerisches Nationalmuseum in Munich. The smith who accepted the job is Vladimir Cervenca from the Tjech republic. Last year i contacted the museum for some more info about the sword and received a friendly mail in reply from the curator with the dimensions of the sword and an offer to get some pictures. Of course i replied positively to Dr. Seelig's e-mail..............and have never heard from them since. I've send them 4 or 5 mails since from different e-mail addresses, assuming i was victim of a spam filter, to no avail. I have three 'low quality' pictures of the sword and the dimensions, and i'm sure Mr. Cervenca can make and acceptable repro of the sword with this info. However i would like to get more detailed pictures of the sword who might reveal more interesting details. This perfect and beautiful sword is dated to 1450-1480. The 36" (91.44cm) blade is unstained, but the hilt is the most remarkable feature of the weapon. The extremely long grip is covered with finely tooled leather. with flattened and gently recurved cross and an engraving of the Madonna and infant Christ set into the front of the pommel. The rim of the pommel bears the inscription O MARIA BIT WIR UNS. Since the sword has been used in an article here and is in the pictures collection, i'm hoping somebody here could help me out with some more pictures. Mr. Cervenca can begin to forge next month, so i'm starting to get in a hurry to get more info on the blade. Welcome! I can't help much with info, but I did find a pic of this one. 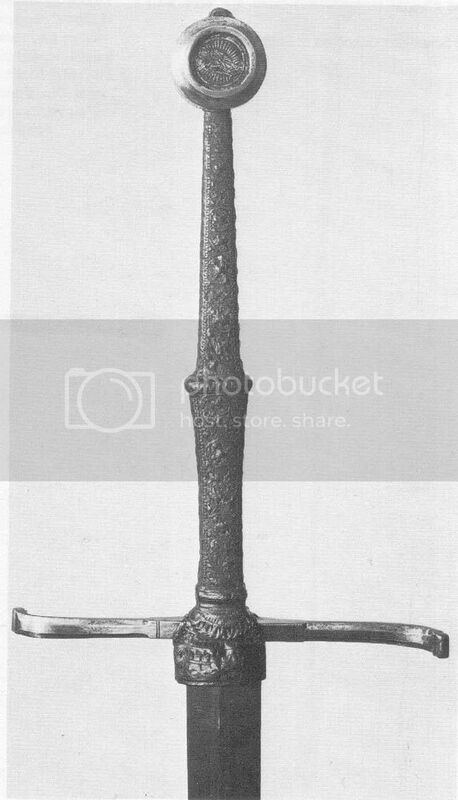 The photo in Records of the Medieval Sword is the most detailed view of the hilt I know of. From the topic Mr Robinson mentions i can conclude that i'm not the only one waiting for pic's from Munich. Now i also have an idea what the scabbard looks like. I've just resend an email to Dr. Seelig's private address and if i get no reply, i'll give them a phonecall, and if really necessary i'll pick up my car and digicam and drive to Munich. No chance in gettin a scan of this ? Thanks for the link Nathan I managed to miss that discussion the first time around but I've learned a bit from it just now. I'll try to get a decent scan tonight unless somebody beats me to it today. You should get the book, though. You need it! I've ordered the book in Januari at a local bookstore, they said time of arrival would be two months and i'm still waiting. The photo Mac just linked to is the one from ROTMS. Thanks, Mac! That gives me a little extra time to get some photos and stats of my new glaive for posting tomorrow! The detailed hilt pic is magnificent, thanks Mr McDonald. Is the leather covering the ricasso going in or over the scabbard ? I think it goes over the scabbard observing the photo from the hilt and the one with the scabbard. This may pose a problem since Mr Cervenca does not make scabbards. The rain guard goes over the scabbard mouth. Look closely at the picture Nathan posted. FWIW, I know that Peter Johnsson has made a reproduction of that sword (I've handled it - not shabby at all), and that he has documented the original while visiting the BNM. It might become part of the Albion Armorers' line-up in the future. So Peter's finished that sword? We need photos of that one! This tread is getting very interesting. 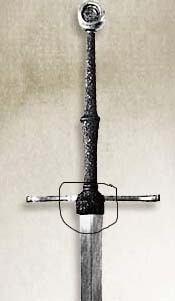 I found some hints in other treads that mr Johnsson was working on a replica of this sword. I'm very interested in the results. What color of leather is the handle covered with ? From the color picture in the photo collection the leather looks blue. Darned straight! Also I almost hope the folks at Albion do NOT make a repro of it because if they do I'll end up owing them a whole lot of money! One wonders if they would be doing the tooled grip and rainguard, if so one would expect that they would be part of the museum line?